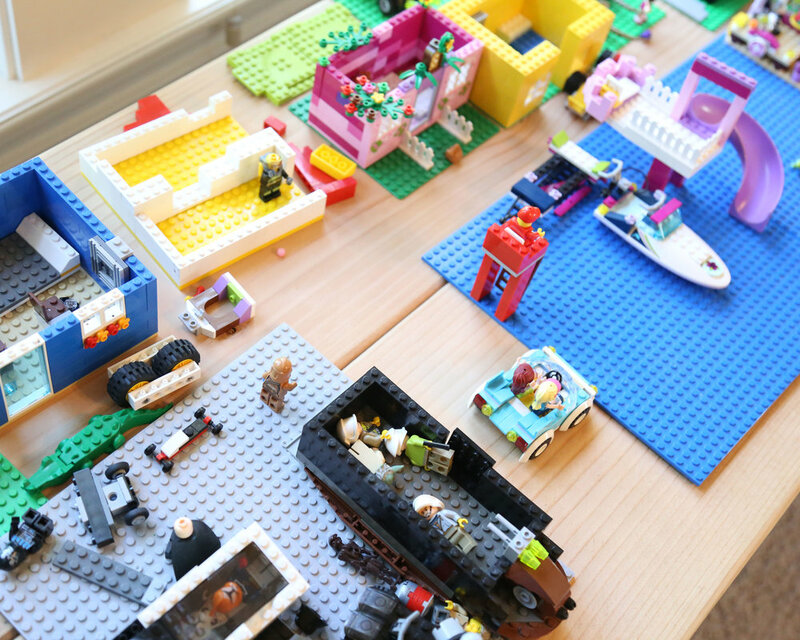 Have you ever watched a child make something, all from their own imagination? Something that never existed until their hands created it? Have you seen the confidence on their face as they find a way to make it work, make it beautiful, make it their own? To me, nothing in the whole world compares. I believe that kids NEED to have a chance to be creative like they need to breath. Sounds dramatic, huh? I can't help it. I'm a big fan of kids creating, but it's the messiest. I am way too OCD for that nonsense. We've all been there---project spread out on the kitchen table for days, paper scraps everywhere. Or, the legos in the rug that surprise you in the dark. No thanks. 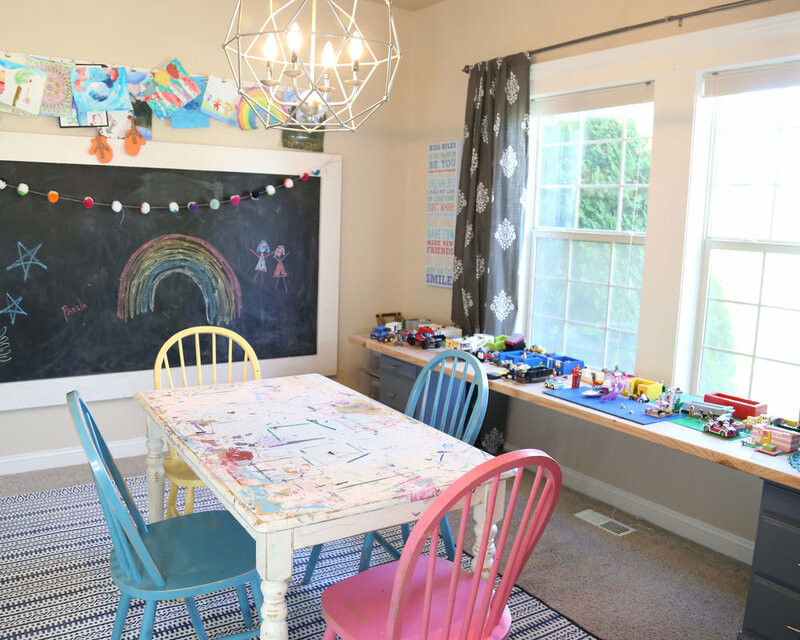 In our last couple of houses, we've had an office or formal dining room that we turned into an Art Room for the kids. 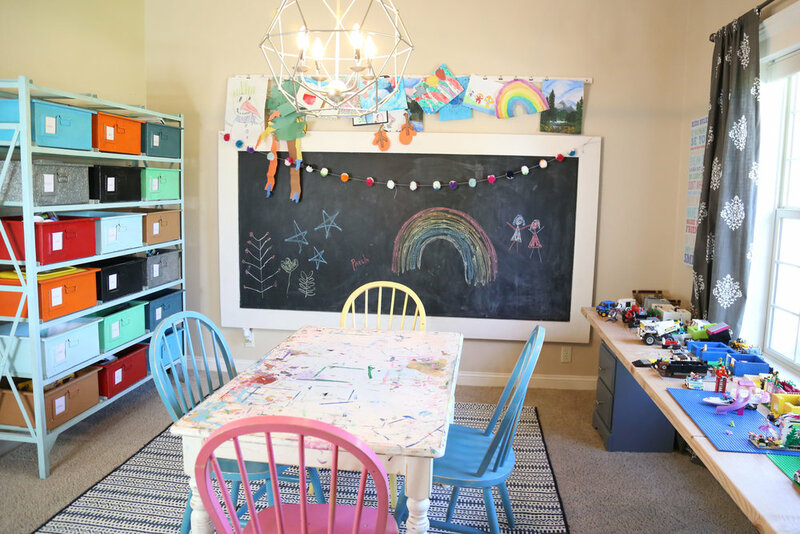 In this house, we decided to have the kids share bedrooms so we could convert a bedroom into a creative space. Hands down the most used room in our house. If you can spare the space, I highly recommend it. You don't need a whole room, even a corner where they have permission to go wild will be a game changer. Here are some components we used that have worked awesome for us. And I plan to paint the walls, eventually (Beige isn't #1). 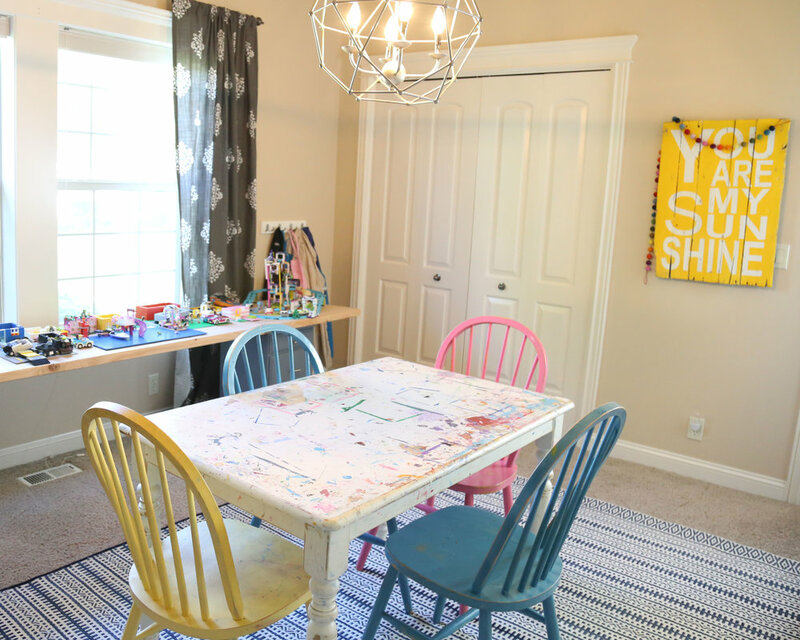 ART TABLE: An inexpensive, thrifted table and chairs (and some spray paint) are key for getting creative. Messes permitted. ART DISPLAY: We used a thin piece of wood and some clamps to create an over-sized art display to show off their masterpieces. LEGO STORAGE: We found 2 matching nightstands at the thrift store too. A little paint and new hardware and we had lego storage for under $30. 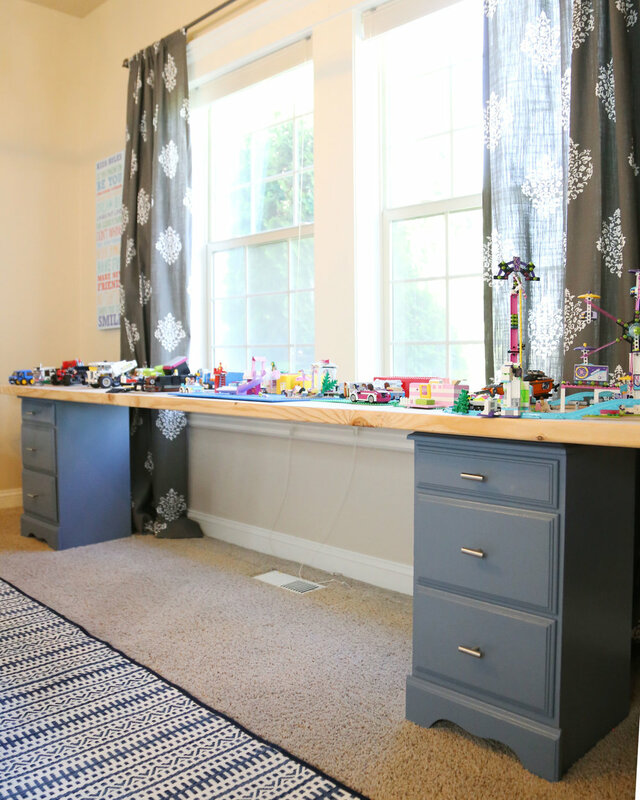 LEGO TABLE: We put a couple of 10 foot 2 x 12's together to span the top of the nightstands for a tabletop. We routed the edges and sanded it smooth, but kept it unfinished so we could sand out any "art" that gets left behind. The top is heavy enough, we didn't secure it to the nightstands, so it would be easy to move. GIANT CHALKBOARD: We used a 4 x 8 sheet of masonite from Home depot, framed it with pine and painted it with chalkboard paint. I love having something huge on a wall and this is a favorite. DRESS UP CLOSET: I've collected costumes for years and this closet gets a lot of action. Hats, Wigs, Shoes, Accessories, Costumes for all sizes (even adults). I love to check out thrift stores for funny things and kids consigment shops at Halloween time to freshen up the old dress up closet. OUTDOOR RUG: The table can get destroyed, but I'm not a fan of painted carpet, so we chose an outdoor rug. Way less expensive (and way more washable) than an indoor rug and I won't even get mad if there is a playdoh mishap. 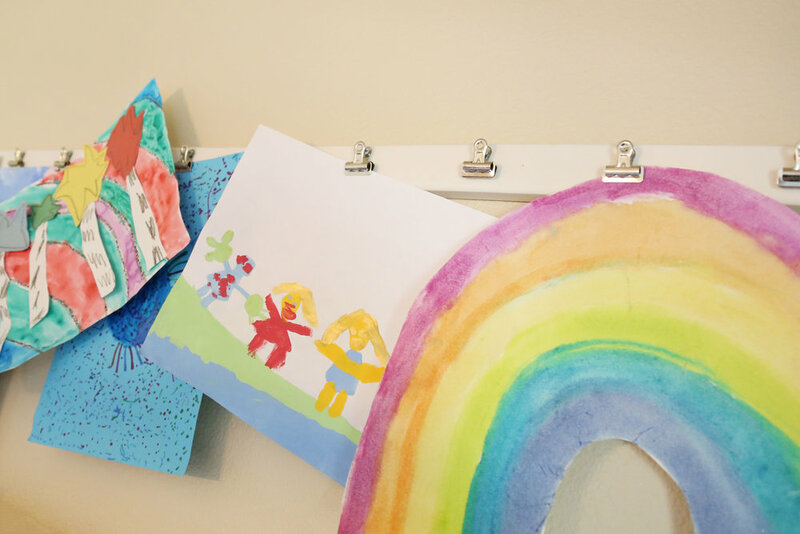 SUPPLIES: Some of our favorites are these watercolors (super vibrant and last forever), playdoh, googly eyes, stencils, all kinds of paper, pipe cleaners, beads, ribbon and string, colored pencils and crayons, etc. THRIFTED SUPPLIES: There is a craft supply area of the thrift store and I always find things there for dirt cheap. I got a huge bag of these stamps for $3 and they get used all the time. I've also found patterned scissors, giant bags of sea shells and big bags of beads. It's worth a look. So, tuck those OCD tendencies in your pocket and let those kiddos at it. I promise they will come alive and there's nothing quite like it in the world. Happy Creating! There is a 4 year gap between my girls. They are still little but not too little so my goal was to create a room they both loved. 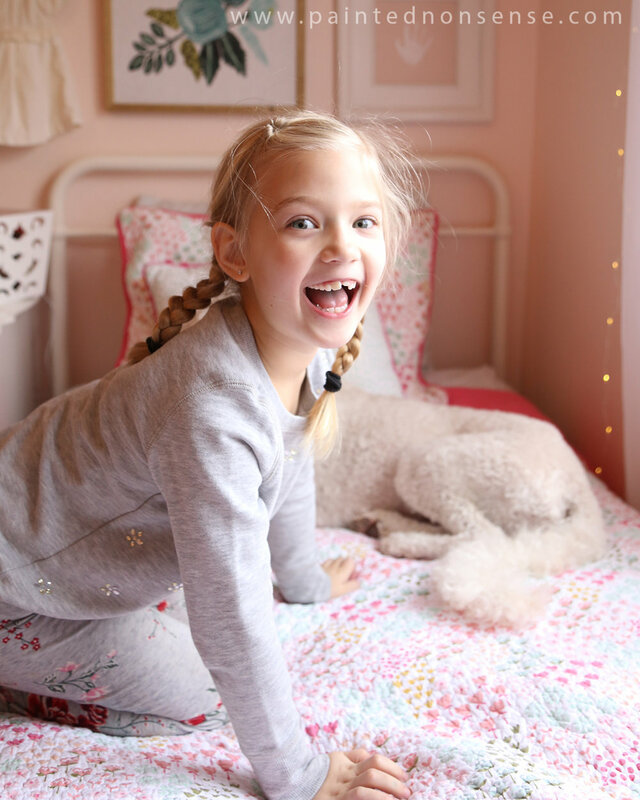 Sweet and fun, simple and cozy. They helped choose the quilts as a starting point and we got busy. First, it was goodbye beige. 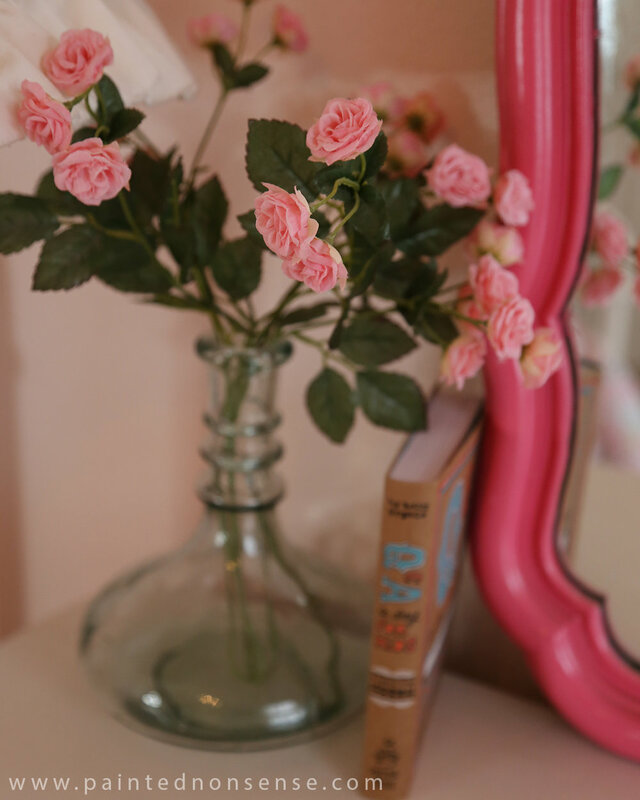 We loved this barely-there pink color from Lowes (Adobe Blush by Valspar). I got the rug on clearance years ago and I was so happy it found it's home in here. We found lots of things at thrift stores and doctored them up to fit the room. The book crate, the vase, the dresser, mirror and the lamp to name a few.